According to a new market report published by Transparency Market Research “Automotive Fuel Rail Market– Global Industry Analysis, Size, Share, Growth, Trends, and Forecast, 2018–2026”, the global automotive fuel rail market is expected to surpass the US$ 5 Bn mark by 2026 and expand at a CAGR of more than 2% during the forecast period. As per the new market research report published by Transparency Market Research, the global automotive fuel rail market is expected to expand at CAGR of more than 2% during the forecast period. The market is primarily driven by the consistently increasing demand for passenger and light commercial vehicles from Asia Pacific and Latin America. Moreover, a key driver of the automotive fuel rail market is the increased demand for electric vehicles, especially for hybrid electric and plug-in hybrid electric vehicles. The fuel rail is a key component of the automotive fuel delivery systems. Enhanced fuel efficiency, increased lifespan of the engine, and lowered pollution are prominent benefits of the common rail fuel delivery system. Common rail fuel delivery systems have been popular since their development. They offer several advantages such as maintenance of fuel pressure irrespective of engine speed and load and reduced peak torque required to supply the fuel by fuel pump. Consequently, common rail fuel delivery systems are able to enhance engine efficiency, engine life, and smoothen engine running. The fuel rail is an integral part of the common rail fuel injection system. Fuel rail is subjected to high pressure ranging from 200 bar to 2500 bar, at which the engine operates. The design of the fuel rail needs to be precise and accurate in order to handle such high pressure. In case of a fuel rail, material selection is a factor of prime importance. The material must possess properties such as formability, heat conductivity, corrosion resistance, and strength. Considering all these parameters, steel is highly preferred by manufacturers. The steel segment of the automotive fuel rail market accounted for a major share of the market, in terms of revenue, in 2017. The segment is expected to expand at a CAGR more than 2% between 2018 and 2026. Besides steel, the other segment of the market is expected to expand at a prominent growth rate in the near future. The other segment consist of materials such as carbon fiber, plastics, and other composite materials. These materials are extremely light in weight; however, they are more expensive than steel and aluminum. Therefore, these are employed in lightweight applications only. These materials are gaining popularity in the automotive industry despite their higher cost, owing to preference of manufacturers toward reduction of vehicle weight, increasing efficiency, and emission reduction. The other segment of the market is expected to expand at a CAGR of more than 4% during the forecast period. There are different types of engines that are tested for an automobile. Among all, inline engines are highly popular, and they hold a major share of the automotive market. Most vehicle manufacturers prefer an inline engine owing to its simplicity and cost-effectiveness. Therefore, the inline engine segment of the automotive fuel rail market accounted for 88% share of total market, in terms of revenue, generated in 2017. The segment is anticipated to expand at a CAGR of more than 2% during the forecast period. Diesel and gasoline have primarily been used as fuels for vehicles since the development of internal combustion engines. Diesel and gasoline have limited sources, and hence, the prices of these fuels have been increasing consistently in recent years. Diesel is considered to be a major source of emission. Diesel vehicles emit more greenhouse gasses than petrol vehicles. Significantly increasing global temperature, owing to global warming, is a serious issue currently. Subsequently, various countries are taking major steps and forming different agreements to reduce emission. A protocol formed in 1997, known as Kyoto Protocol, was signed by developing nations to take actions in order to reduce greenhouse gasses. In 2015, a similar agreement was signed, called the Paris Agreement, by more than 190 nations, globally. The agreement decided to reduce manmade CO2 emission in order to keep global warming well below 2°C. Various countries are taking major steps to eliminate key sources of emission and comply with meet the agreement. As part of the steps, several countries have implemented a ban on diesel vehicles and in the future, several other countries are expected to follow. Consequently, the percentage of diesel vehicles is anticipated to decrease drastically during the forecast period. Therefore, the gasoline segment of the automotive fuel rail market is likely to expand at more than CAGR of 3% during the forecast period. Increasingly stringent emission norms, raised awareness about vehicle emission and its impact over global warming, and government support are fueling the demand for electric vehicles, which produces comparatively lower emission and are considered as eco-friendly. North America and Europe are witnessing an increased demand for hybrid electric vehicles and plug-in hybrid electric vehicles. Plug-in hybrid electric vehicles are more effective than hybrid electric vehicles; however, hybrid electric vehicles are dominating the market owing to a lack of charging infrastructure. The hybrid electric vehicle segment of the automotive fuel rail market is expected to expand at a CAGR of 32.78% during the forecast period. The report comprises the market segmentation based on sales channel, into OEM and aftermarket. A fuel rail, once fitted in an engine, rarely needs to be replaced. It has a lifespan that equals the life of an engine. In case of a crash, where the engine is damaged, a fuel rail is likely to require replacement. Therefore, the OEM segment dominates the automotive fuel rail market. The segment is anticipated to expand at a CAGR of more than 2% between 2018 and 2026. Asia Pacific comprises densely populated countries such as China and India. These countries are witnessing rapid economic expansion. Enhanced infrastructure, increased per capita income owing to the expansion of the industrial sector, and scarcity of vehicles as compared to the population are fueling the demand for passenger vehicles in these countries. Asia Pacific accounts for about 50% of total passenger vehicles available globally. The passenger vehicle segment dominated the automotive fuel rail market and accounted for more than 75% share of the market, in terms of revenue, in 2017 owing to the considerable number of passenger vehicles in Europe and Asia Pacific. The passenger vehicle segment of the market is anticipated to expand at a CAGR of 2.11% during the forecast period. North America has a significant number of commercial vehicles. A large mining industry coupled with consistently expanding construction and agriculture industries are fueling the demand for commercial vehicles across North America. Asia Pacific is largest region, globally, and accounts for more than 50% of world’s population. Therefore, the region comprises a considerable number of vehicles. In terms of revenue, Asia Pacific accounts for a prominent share of the global automotive fuel rail market. The market in the region is projected to expand at a CAGR of 3.06% during the forecast period. Key players operating in the global automotive fuel rail market include Cooper Standard, Magneti Marelli S.p.A., Roberts Bosch GmbH, Nikki Co., Ltd., Keihin Corporation, Landi Renzo S.p.A., Linamar Corporation, Standard Motor Products, Inc., Continental AG, ASINI SEIKI Co., Ltd., Sanoh Industrial Co., Ltd., and TI Automotive. 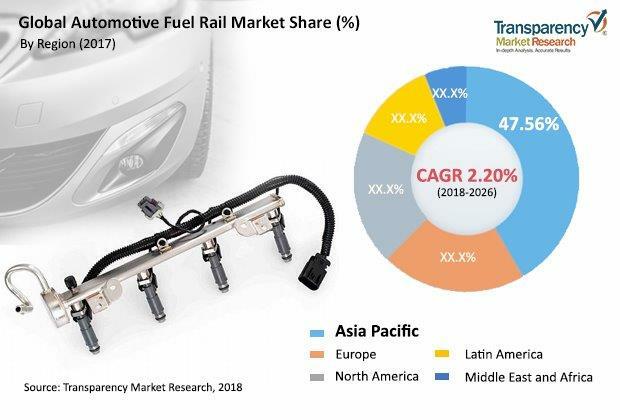 The global automotive fuel rail market witnessed significant merger and acquisition activity that was focused on developing advanced fuel rails.